How do you test an RV converter? We are installing a satellite dome system on our motorhome and we are getting "dirty power" which keeps blowing out some of the sensitive electronic components. 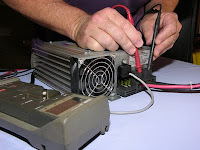 (1) Verify the proper incoming AC voltage. Be sure the incoming voltage falls between 103 volts AC and 130 volts AC. High and low voltage can have a damaging effect, not only on the converter, but other AC components as well. (2) Verify the correct polarity. Reversed polarity or an open hot or neutral wire somewhere in the 120-volt supply system can indeed be harmful to the converter. Always check the polarity and test the GFCI each time you enter a new campground. If it is not correct, move to a new site or simply do not plug in the shoreline. Likewise, check the polarity of the DC conductors from the battery. Some components may be damaged if the battery is miswired. (3) Eliminate the battery as the culprit. Because of their close association, many times the converter is blamed for battery or other DC system-caused problems. (4) Make sure all electrical connections are clean, dry and tight. Many electrical problems are traced to loose wires and connections. It is a common occurrence because of the jostling most motorhomes endure during their lifetimes. Should you need to call a service facility or seek advice, having the above voltage information handy will provide a starting point to begin troubleshooting. Due to the level of sophistication in today’s power converters, if a problem proves to be interior to the converter, it is recommended that the converter be shipped off for repair. 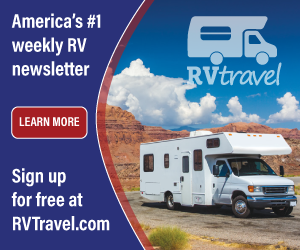 Some well-trained RV service facilities may offer internal converter repairs as a service, but most are probably not fully equipped to handle all possible scenarios. Many components are not field repairable, yet they can be repaired or replaced relatively inexpensively. Some do have module boards that are easily replaced if necessary, albeit, not inexpensively in most cases. All converter manufacturers have a service and repair facility in-house or one that they can recommend to perform internal converter repairs. Contact your converter manufacturer for the details of their service policy. If your converter has out-lived its manufacturer (it does happen), contact Master Tech at 800-848-0558.